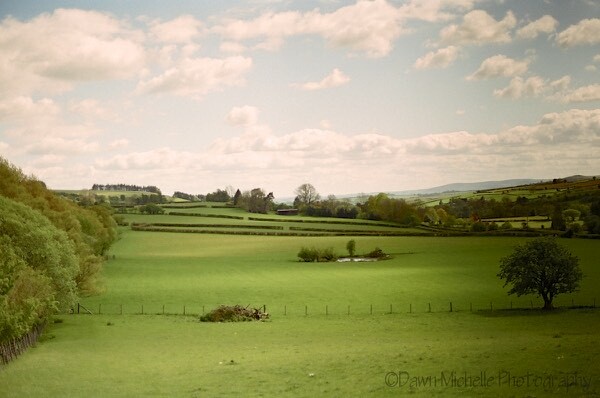 Taken along the Offa’s Dyke Path approaching Knighton, Wales. The Offa’s Dyke Path is on the left side of the picture, next to the long row of trees. I was facing south and looking back from where I had just come from. This country is just amazing and beautiful. I can’t say enough about it. I cannot wait to return to Wales and explore the land and culture some more. Unfortunately, this roll of film did not develop well. Either it was damaged to begin with or it was damaged while traveling, who knows. But a majority of the roll has a dark shadow that follows along the right side. This one wasn’t so bad and I think still looks decent and interesting. That’s the gamble of film though. Taken with my Canon AE-1. Absolutely gorgeous! The greens are simply eye-popping.